Here’s to being lazy and not wanting to do anything at. all. after work. That’s exactly how I felt last night. I managed to take my dog for a walk around the neighborhood but after that, I laid around on the couch. I finally made myself something to eat around 8pm. Such a slacker I am. I really had no motivation to do anything last night, not even to write this post. But I gave myself a little internal pep talk so I could write this post and share this lentil chili with you. So let’s talk about danger in the kitchen. Haha. I could make a TV show about that. DANGER…In the Kitchen. Catchy. Of all the minor injuries I’ve received in the past few months, most of them occurred while I was in my kitchen. Who the heck burns themselves on a slow cooker? ME. I burned myself on my slow cooker on Thanksgiving while I was making sweet potatoes. Who the heck almost chops off the side of their finger while trying to cut a lime in half? ME. I gave myself a pretty nasty cut over the weekend while trying to cut a lime in half. A freaking lime. That little sucka rolled when I tried to slice it and instead of slicing it, I sliced my index finger. Expletives ensued. Bandaids and Neosporin were sought out. I had to endure the uncomfortable feeling of trying to complete tasks while wearing a bandaid on my index finger. But enough about kitchen disasters. Let’s talk kitchen wins. This lentil chili is a total kitchen win. It was born on a night that I was almost too lazy to write down the recipe and take the photos. All I wanted to do was throw stuff in a pot, cook and then eat. But a little pep talk happened and I made myself write down the recipe and take some photos. I’m so happy that I did. 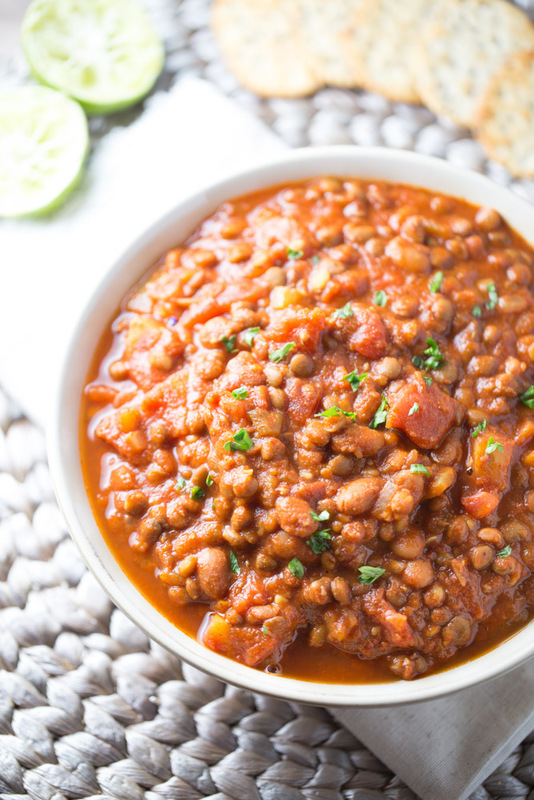 This lentil chili is delicious and it only took 2o short minutes to make! It’s healthy and vegan, too. 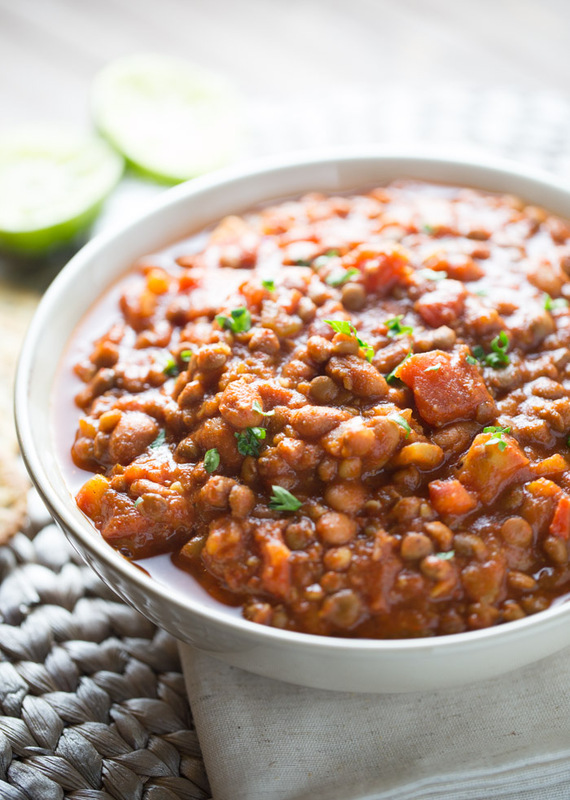 This simple and delicious vegetarian lentil chili is ready to devour in 2o short minutes. Make it your own by topping with your favorite cheese, low fat sour cream and herbs! In a large pot, heat the olive oil over medium heat. Add the onion, peppers and garlic and saute until tender, about 2-3 minutes. Add the remaining ingredients and mix well. Simmer for 10 minutes, stirring occasionally. Serve in bowls and top with your favorite toppings. I’m the worst with kitchen injuries! I grated the side of my thumb on Saturday when I was trying to grate cheese and it STILL hurts. Ugh. This looks so delicious! Lentils and pintos are my favorite beans so I know I’d love it! I’ve totally done that before, Amanda! Cheese graters are dangerous! Thanks for stopping by. Pintos are my favorite, along with black beans! If you are using lentils from a bag do you just cook them first? Hi Brittany! Thank you! Yes, you would just cook them according to package directions first and then use them in the chili once they are done cooking. You could use a kitchen scale to weigh them in ounces to get the same amount as 2 cans or measure about 3 1/2 to 4 cups of lentils if you don’t have a scale. If you give it a try, stop by to let me know how it turns out! I totally get this whole post. Sometimes getting motivated is tough, I am kind of an all or nothing kind of girl. I also seem to always have a cut or burn on my hands from the kitchen… you think I would learn. Beautiful soup. Sharing now! Thanks for sharing, Amy! I was feeling lazy again today after work. And tired. I think I just need to get to bed early tonight and then maybe I’ll have more motivation tomorrow. Hope you have a great week and thanks for stopping by! I’m going through a serious lazy phase right now and this is right up my alley! Haha, must be the season. So much work around the holidays, now we are all lazy. But truthfully, I get lazy quite often. ;) Thanks for stopping by, Jocelyn! I am forever grating my thumb whenever I grate cheese! Ugh! Now this chili I would be happy to eat. We adore lentils especially my little one. I love lentils although I order them when we are out but I haven’t ever made them. This recipe gave me the inspiration that I needed! 20 minute chili? I’m in LOVE! This looks amazing Julie! l can be such a klutz in the kitchen some days and have been feeling lazy and tired lately too. This easy 20 minute chili is just what I need! It looks so hearty and delicious! I totally fell asleep on my couch after I got home from work today. I’m completely worn out! Thanks for stopping by, Kelly. I hope you enjoy the chili if you give it a try! btw, I am loving this new layout! So clean! Thanks Graham. I’m totally digging the new layout, too! Looks good! I’m a fan of lentils & chili, but haven’t put the two together. Good idea! Oh you must put them together and try all of their yummy-ness, David! Seriously, best chili I’ve made in a while. I’ve already picked up ingredients to make it again. :) Thanks for stopping by! This is such a great recipe, so quick and healthy! LOVE!!! This looks wonderful. I’m always on the hunt for good stews and soups this time of the year and I love this one with a Tex-Mex flair. Thanks for sharing. I have that lazy meh feeling October through April here in Holland :) It’s so dark (the sun’s out from 9 am till 330 pm) and doing anything after work feels like a total chore. Whoa. That’s kinda crazy, 9 – 3:30?! I can’t imagine! I get annoyed when the time changes here, resulting in it getting dark at 5:45pm.I should be thankful for daylight until 5:45, right?! I hear you about not wanting to do anything after work! Especially when the winter rolls around, I’m a big ‘ole couch potato! 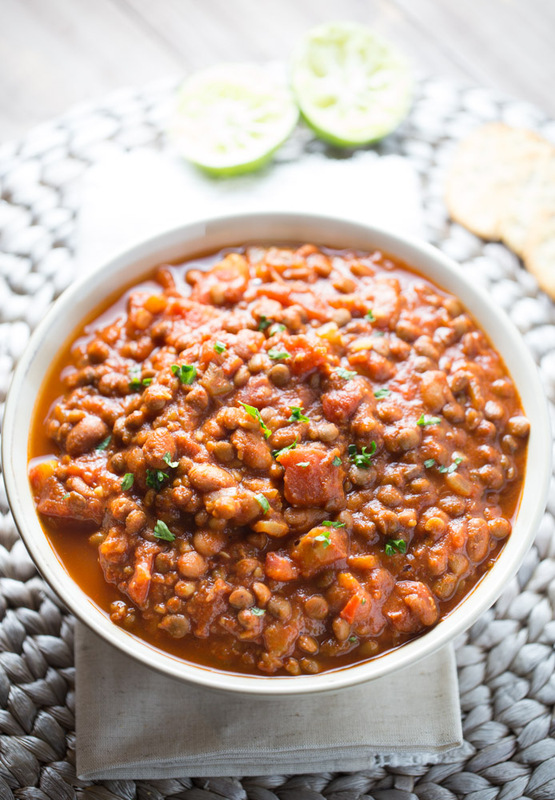 This lentil chili looks like the perfect weeknight dish, Julie! I definitely have to try adding in lentils the next time I make chili. Sounds delish! I have never been in extremely cold weather – the coldest I’ve experienced is about 18 degrees. I can only imagine that I’d be a big huge couch potato if it was cold all the time here in FL! Hope you enjoy the chili if you give it a try, Gayle! Lazy is exactly how I’ve felt all week! Monday night I pretty much went home and parked myself on the couch with my laptop and didn’t really move. I’m trying to get more productive as the week continues :) I definitely need to add this lentil chili to my weeknight menu! I’m still feeling so lazy, Ashley! I need to snap out of it fast. Hope you are able to snap out of it as well. Thanks for stopping by. Hope you enjoy the chili if you give it a try! Haha, I know that feeling. I feel the same way after eating the heavy meat chilis, too. And about that lazy feeling – I’m still feeling it 100%. Gah! I hope I snap out of it soon. Thanks for stopping by, Helen! I sliced my finger last week too!! Chopping goddamn onions with a new set of knives. Dislike them strongly right now. Anyways, this chilli looks amazing!! I need more ways to eat lentils. Yum! This is the kind of comfort food I need in my life right now. Glad you like the recipe, Phoebe! Thanks for stopping by! Oh wow, haha. I haven’t burned my face with any cooking utensils – yet! But the way I am in the kitchen, it will probably happen one day. ;) Hope you enjoy this chili if you give it a try, Natalie! As we move into fall I’m looking forward to chili and soups. Thanks for sharing on To Grandma’s House We Go! I’m loving all the soups and chilis I’m seeing – it means fall is almost here! Thanks for sharing at the What’s for Dinner party! Your vegan chili looks amazing. Thanks for sharing your recipe at the inspiration spotlight party. Pinned and sharing. See you again soon. 2i0 minutes, wow! How fabulous is that? Thanks for sharing with SYC. Easy and delicious, my kind of chili and a great time to have a nice bowl of delicious chili! Hope you are having a great week and thanks so much for sharing with Full Plate Thursday! Pingback: The Best Fall Soup Recipes - Coral + Co.